The subglacial Grimsvötn volcano, Iceland, started erupting on November 1, 2004 around 22 GMT. An intense swarm of volcanic earthquakes that started about 3 hours earlier changed at that time to continuous low frequency tremor, indicating onset of an eruption. Weather conditions prohibited direct observations of the beginning of the eruption at this remote volcano situated near the center of Europe's largest ice cap, Vatnajökull. The eruption was preceded by both long-term and short-term precursors, and finally triggered by release of overburden pressure associated with a glacial outburst flood (jökulhlaup), originating from the Grimsvötn subglacial caldera lake. Accumulation of magma in a shallow magma chamber under the Grimsvötn caldera has been ongoing since its last eruption in 1998 (Sturkell et al., 2003; Sigmundsson et al., 2004). GPS measurements show uplift of 5-10 cm/year in the caldera center, and horizontal displacements away from the caldera. Earthquake activity increased in middle of 2003, at about the same time uplift exceeded its 1998 maximum. Pressure in the Grimsvötn magma chamber is likely to have exceeded its pre-eruption level from 1998 at this time. Additional uplift and expansion of the volcano since then suggested approaching failure of the volcano. Earthquake activity increased further in late October, 2004. Geothermal heat sustains a lake in the caldera that intermittently causes glacial outburst floods. On October 26 high frequency seismic tremor indicated increased water flow from the caldera lake and suggested that a glacial outburst flood was about to begin. On October 29 discharge increased in river Skeidara. The outburst flood was caused by high water level in the Grimsvötn caldera lake from ice melting by geothermal activity. The release in overburden pressure associated with the outburst flood triggered the eruption. The drop in water level in the Grimsvötn caldera at the onset of the eruption is uncertain, but is probably on the order of 10-20 meters, corresponding to a pressure change of 0.1-0.2 MPa on the volcano surface. This modest pressure change triggered the eruption because internal pressure in the Grimsvötn shallow magma chamber was high after continuous inflow of magma to the volcano since 1998. The eruption is proceeding from an approx. 1km long, E-W oriented fissure located in the south-eastern part of the Grimsvötn caldera. The ice thickness in this part of the Grimsvötn caldera was approx. 200m prior to the eruption. A few hours into the eruption the column reached a height of approx. 13km according to the radar measurements of the Icelandic Metrological Office. 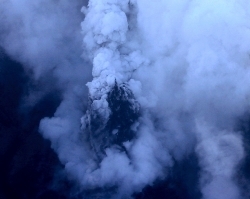 Twelve hours into the eruption the column had a height of approx. 8-9km. The plume is leaning to the north-east by south-westerly winds. The ash fall sector extends at least 150km from the eruption site. The distal ash plume has been observed in Norway, Finland and Sweden. Third day of continued eruption from the Grimsvötn volcano, Iceland. 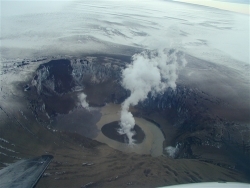 From the second reconnaissance flight yesterday, it was observed that the eruption occurs from a circular vent approx. 1km in diameter in the south-eastern part of the Grimsvötn caldera. At the homepage of Prof. Magnus Tumi Gudmundsson a detailed map showing the location of the eruption vent as well as additional pictures can be found. Fourth day of the eruption from the Grimsvötn volcano, Iceland. 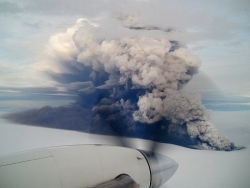 The morning reconnaissance flight around Grimsvötn volcano showed that the intensity of the eruption has decreased substantially. 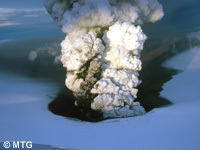 A continous plume of white steam is seen rising from the crater. Bursts of phreatomagmatic explosions occurred with intervals. The explosions were sending jets of ash and fragmented ice approx. 1km up in the air. The bouyancy of the ash and steam column additionally lifted the plume up to a height of approx. 4km. Today the ash fall was limited extending approx. 5km downwind in a southerly direction. In cauldrons in the eastern part of the Grimsvötn caldera melt water could be seen flowing in an easterly direction out of the caldera (see map of the Grimsvötn Caldera at the homepage of Prof. Magnus Tumi Gudmundsson). From todays aerial surveillance of Grimsvötn volcano by Flugmálastjórn Íslands the activity can be characterised by small, predominantly steam explosions from the vent. The eruption at Grimsvötn volcano ceased between Friday night and Saturday morning, November 6th, 2004. 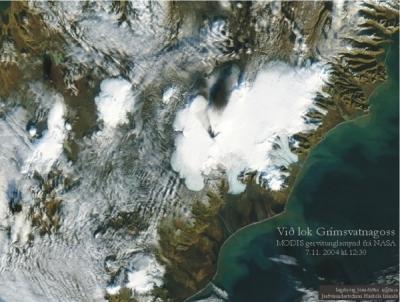 MODIS image from NASA showing the ash fall deposit from the Grimsvötn 2004 eruption in the northern part of Vatnajökull.